1. Set the room up from bottom to top. This may seem like a no-brainer but your baby is small and they start their lives living in the bottom two-ish feet of a room. When you’re organizing and setting up your baby’s nursery, you need to think from the bottom and go up. This means keeping the floor clear of anything but necessities and a couple baskets of toys. The more items on the floor or within their reach, the easier it is for them to get into something they shouldn’t. 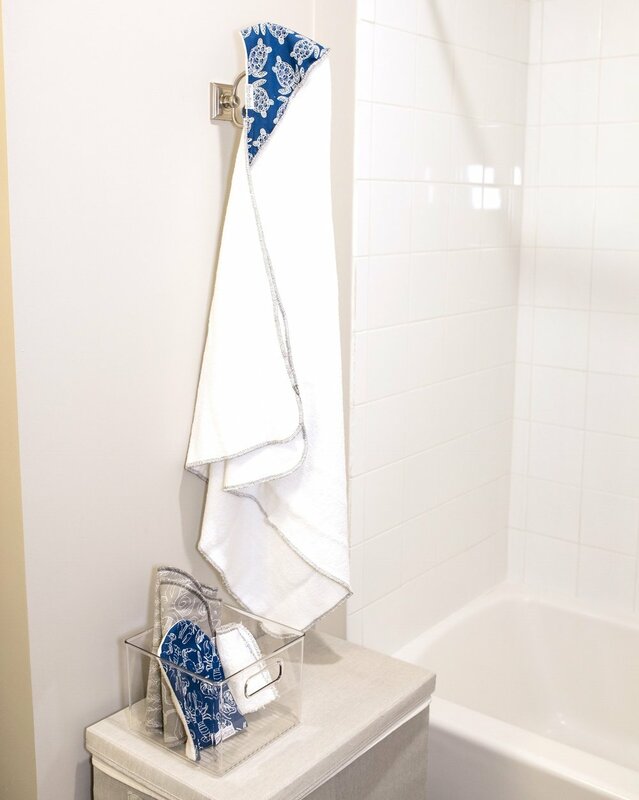 Hang Moss & Marsh towels up high, store diaper bags on a shelf and keep baby products up out of reach. Going off tip #1, your baby is going to get into everything that’s on the floor. Heavy wicker and wire baskets or wooden crates are beautiful, but will hurt her when she tries to pull up and it flips over. Instead, opt for soft-sided baskets like these from Pottery Barn. 3. Create a diaper caddy. Diaper changes are so much easier when you have everything you need together and within reach. Use a clear container like this to store the essentials: diaper cream, nail clippers, a few diapers, Moss & Marsh burp cloths and a swaddle. 4. Reminisce on college days. 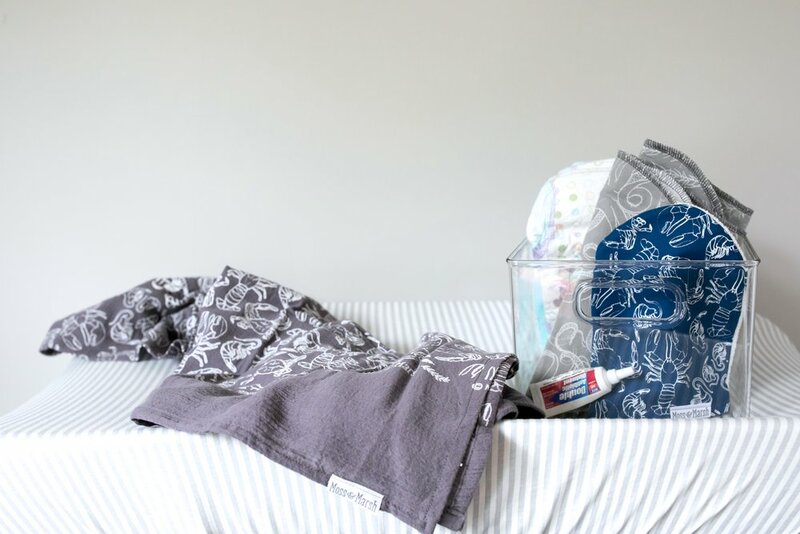 Make your baby a shower caddy, just like you used to have in the dorms. Have it stocked with shampoo, a Moss & Marsh bath mitt and a cup for rinsing. Having it in a clear container or caddy will make it easy to grab what you need. Make sure you have your hooded towel within reach for when bath time is over, so you aren’t scrambling to find one. And when you’re done with bath time, you can put it back up on a high shelf so her little hands can’t get into it. 5. Hang baby’s outfits together. To make getting your wiggly baby dressed a little bit easier, hang all the pieces of an outfit together. For example, put a onesie, overalls and matching Moss & Marsh bib all on one hanger so it’s just grab-and-go. These are just a few tips to help you get you baby’s nursery organized. We’d love to know, what organizing tips have worked best for you? Which ones of these do you plan to try? Comment below and let us know! Where to find us: We’ve had so much fun sharing with you our favorite ways to organize a nursery. For more organizing tips and tricks, follow us on Instagram, on Facebook, and on our Blog. We love to hear from you about what you’d like to hear more of and what organizing products you love, so drop us a line or send us a DM!